Flying a collapsible wing is a unique concept in aviation, one that paraglider pilots have become accustomed to. With the right equipment, good awareness of the weather and careful route choices it’s unlikely that you’ll suffer more than minor tucks. Nonetheless, we all know that a catastrophic collapse can happen. With that risk comes an obligation to be continuously vigilant and ready to deploy your reserve. Although this article aims to mentally prepare you for parachute deployment, this does not replace the need for proper safety (SIV) training, where you will get in-depth knowledge and build practical skills. Also look out for club repack sessions where you can become familiar with deployment and repacking. Check your product manual for more instructions. 1. If you’re entangled in a midair collision, throw it. Best both pilots throw, to reduce the risk of downplane. 2. If your wing suffers structural failure that makes it unsafe to fly, throw it. 3. If you end up in irrecoverable situation with a high descent rate, throw it. 4. If you find yourself in high-G situation where you risk blacking-out, throw it. 5. If your wing collapses, you don’t always have to throw: it depends on the situation. With experience and some SIV training you can learn to identify how bad a collapse really is and if it is recoverable. If you have lots of height, and your fixes aren’t working, try holding the brakes at full stall position for a slow count to five, and restart the glider (gradually) from there. If that doesn’t work, try holding your hands at the zero brake position. Fixing the mess can take your attention away from your height, so decide what your throwing height is, and monitor your height against this limit. I set mine at 500ft (150m) above the ground: the minimum required for a clean deployment. In a spiral dive (-15m/s) that means ‘ten seconds to live’ (and, if your reserve is good and big enough, hopefully still walk). If I’m below this (launching, scratching, landing) I’m flying in the red zone. If my wing stops flying here, I will throw instantly. Even if the reserve only gets rid of my horizontal momentum, it has done something useful. If the situation is getting worse, or you’re below your throwing height (500ft/150m), throw your reserve! Practice this so that you can find your reserve handle with your eyes closed. You may be disorientated in a spiral dive, so it helps to run your hand down your risers then along a main feature of your harness. Keep your arm close to your body as you reach for the handle to improve G-force resistance. Each harness has a different geometry, so practice deploying your reserve while suspended. Sometimes it is possible to deploy your reserve in one continuous outward pull, letting the handle go when your arm reaches full extension. Sometimes this will not provide enough power, and twisting the wrist while pushing the handle forwards can give a more effective first stage. Some harnesses require muscle power to release the reserve. Velcro closures on the harness may also become tightly bonded due to lack of regular inspection. Become familiar with your equipment. To the side of you is usually clear, but your main glider might be there, which would result in a failed deployment. Be especially careful when you are in a SAT / auto-rotation manoeuvre. Throw hard, aiming just behind the trailing edge. If possible, kill the rotation before deploying. Fling the reserve out and away from your body. Remember to let go of the handle! Check that it is deploying correctly. It may need a tug to get the skirt to billow open. This pilot makes a good deployment, resulting in a fast and clean opening, and then keeps his eye on the reserve until he sees it open, before focusing his attention on the wing. A heavy B-line stall might disable the glider and limit the down-plane. You’ll need a lot more pull than you would use during freeflight. This is my go-to first position. If you have height, allow the glider to pitch way below the horizon as the reserve fills, which should induce a massive front tuck. 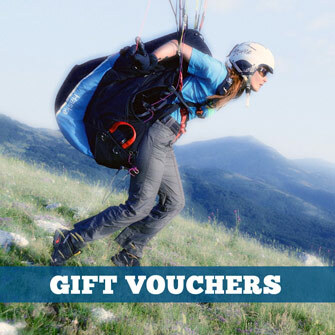 If you can catch some of the fabric in your hands as the glider blows past you, you can neutralise the danger of the main wing by bunching it in. This is a likely option for first-time deployments and nice (large) reserves, where the surge often takes the pilot by surprise. After wrapping the brake lines over your hands many times (taking wraps) you can induce a full stall, but this can be difficult to achieve on a low rated wing, and unstable. Cut-away the wing, using quick release carabiners or a hook knife. *In this video Urs is testing the Beamer 3 (Rogallo-type reserve) at 15 kg above the recommended maximum load, at 2000 m AMSL. Note that the overloading is for testing purposes only, not generally recommended for normal use. In the first deployment (00:39) Urs induces a heavy B-line stall as soon as the Beamer 3 inflates (00:45), the best technique. He then holds the B-line to stabilise the wing with one hand, and uses the other hand to steer the Beamer. Once the B-line has been induced it’s less physical to hold in. Note how the wing quickly stabilises and moves to a position above him. Note also his very impressive (low) sink rate, around 4.5 m/s when he lands, despite being 15 kg over the top of the weight range, wing still attached and landing at over 1700m AMSL, on his feet! In the second deployment (02:12) Urs does nothing after the Beamer 3 inflates (“Look mum, no hands!”) , to demonstrate a worst-case scenario (excluding the ‘reserve eater’ nightmare scenario) where the wing is most likely to cause downplaning. It’s noticeable that his sink rate is generally higher in this configuration, as the wing is effectively flying downwards, pulling him down. Even so his sink rate is still mostly below 6 m/s, and a down-planing situation does not occur. After a while (2:54) Urs induces a heavy B-line stall again, whereupon the wing immediately stops flying and quickly returns to a position above him. Once again his sink rate reduces markedly, generally staying below 4.5 m/s. Very impressive, especially when bearing mind the high altitude and 15 kg over-loading! Make sure you get your legs underneath you during the descent, because the landing will be hard. There is a tried and tested method for avoiding injury in high-impact landings. 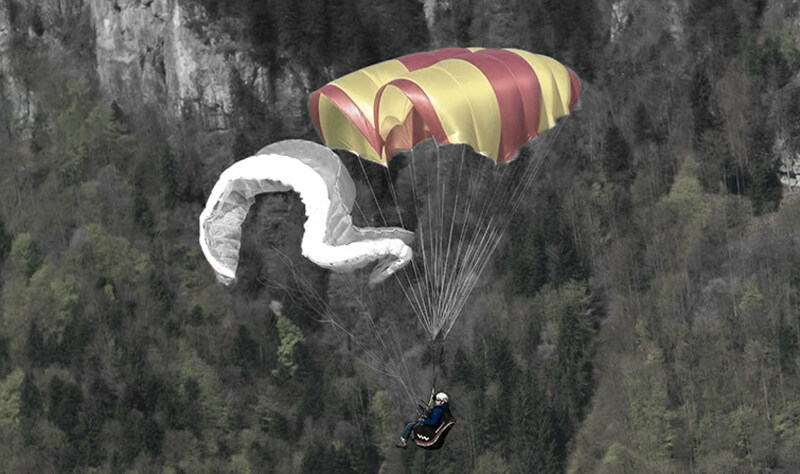 The Parachute Landing Fall (PLF) needs to be practised to be fully effective. Remember to keep your ankles together, your knees together and slightly bent, your body and feet turned at a slight angle to the direction of impact (45 degrees). Present your calf to the ground first, then your thigh, then the hip, then tuck your torso in and roll, straightening your legs as you roll over on your back. In windy conditions, being dragged is a big risk. You need to get on your feet as soon as possible, and run towards your reserve, pulling the bridle in. This is awkward, especially if your main glider tugs at you as well. Have your hook-knife accessible, in case the situation gets out of hand. An alternative is to unclip from the harness and wriggle out. If in doubt, get it out! Reserve parachute deployment might sound extreme, and it is, but there have been hundreds, if not thousands, of successful reserve deployments worldwide that have saved lives, so they really do work. To demonstrate this, we’ve included a couple more educational examples below. In the next and final example here, the pilot makes a good decision to throw, and pulls the handle. However, due to incorrect installation by the pilot, the reserve comes out of it’s inner container too soon, preventing him from throwing it away from him and the wing. This could have been disastrous if the reserve canopy material or lines had gotten caught on the harness or pilot. Fortunately, despite a very poor deployment, the reserve does not catch on anything and opens successfully anyway, quickly overpowering the wing. The glider very quickly ends up with multiple twists in the lines, limiting what the pilot can do, but he managed to reel in one of the brake lines at least, keeping the wing in a stalled state. He then manages to steer his reserve and ends up landing on a garage roof between two chalets close to the lift station, with a whoop of relief! So don’t be afraid of using your reserve. If in doubt, get it out! Which one is the best for you? Find out more about How to Choose the Right Reserve.